Did you know that 100 years ago volunteer recruits for the British Army were learning how to build trenches on the Downs above Shoreham? All that remains today are faint traces on the grass to show where hundreds of trenches were dug by the recruits stationed at Shoreham Army Camp. 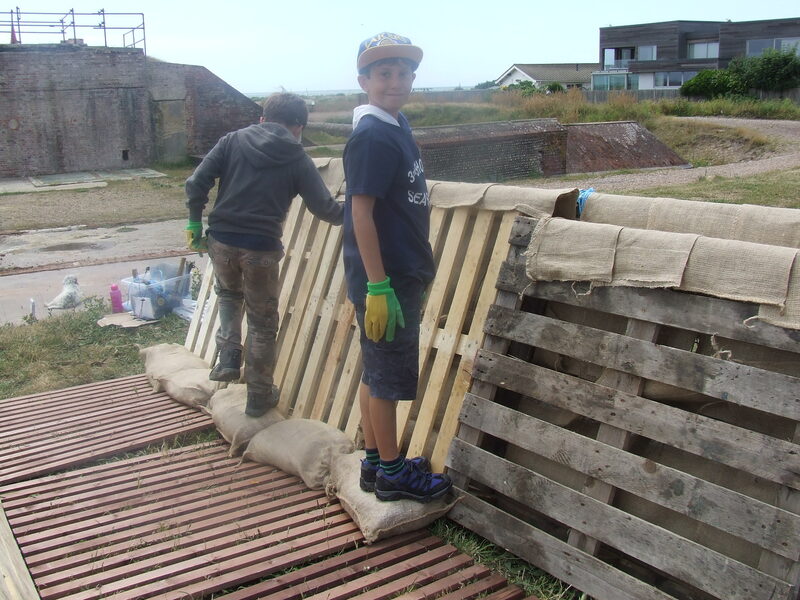 On Sunday 5th July we worked with local Shoreham Sea Scouts and the Friends of Shoreham Fort to create a representation above ground of the walls of one of these training trenches. Trench building plans, end elevation. 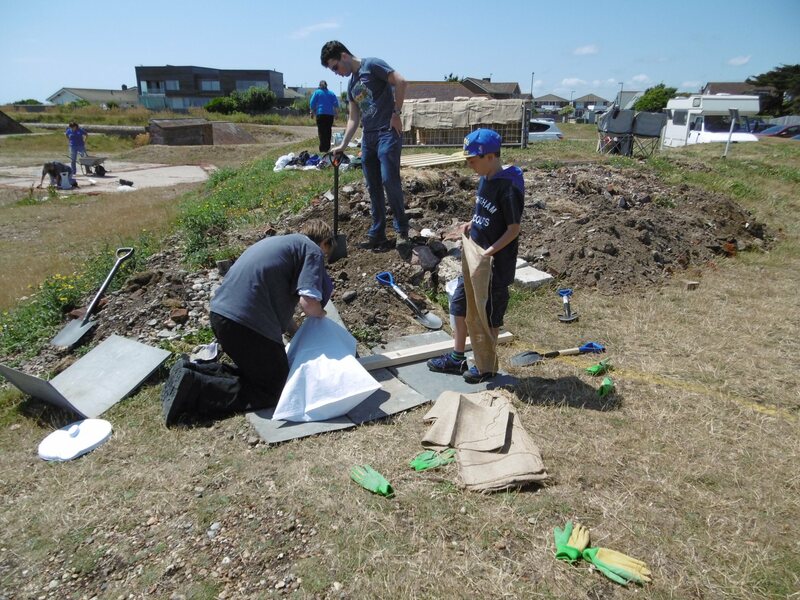 Our trench building challenge was taken up by an intrepid ‘four person army’ – 3rd Shoreham Sea Scouts Aiden, Millie, Ruari and William who were supported by young leader James and Scout leaders Sandra and Colin. We built up the walls of our trench representation with metal fencing and wooden pallets, created a floor with duckboards and filled at least 40 sandbags to top the walls and build up a firing step along the sides of the trench. 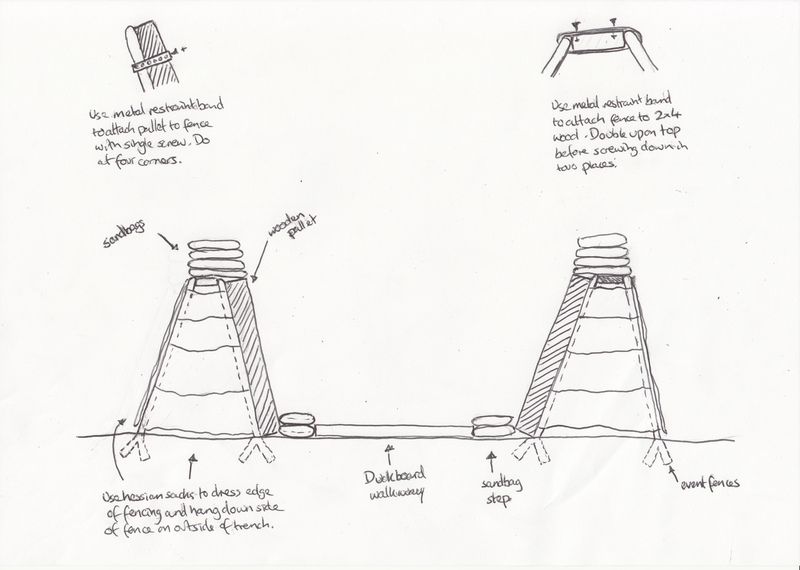 We also created periscopes to spy over the top of the trench wall – all this in only 4 hours! Members of the public were constantly popping by to see what we were up to and the families of the Scouts came along to help out later in the afternoon. All of which was a great way to raise awareness of our Heritage Lottery Funded project, ‘Training for War: Exploring Shoreham Army Camp 1914-1919’. The Scouts learnt a bit about the trenches the recruits at Shoreham were building 100 years ago through maps, postcards and aerial photographs provided by Worthing Museum. Gary from The Friends of Shoreham Fort gave a great tour of Fort and treated the Scouts and their families to an unique handling session with some original WW1 materials. 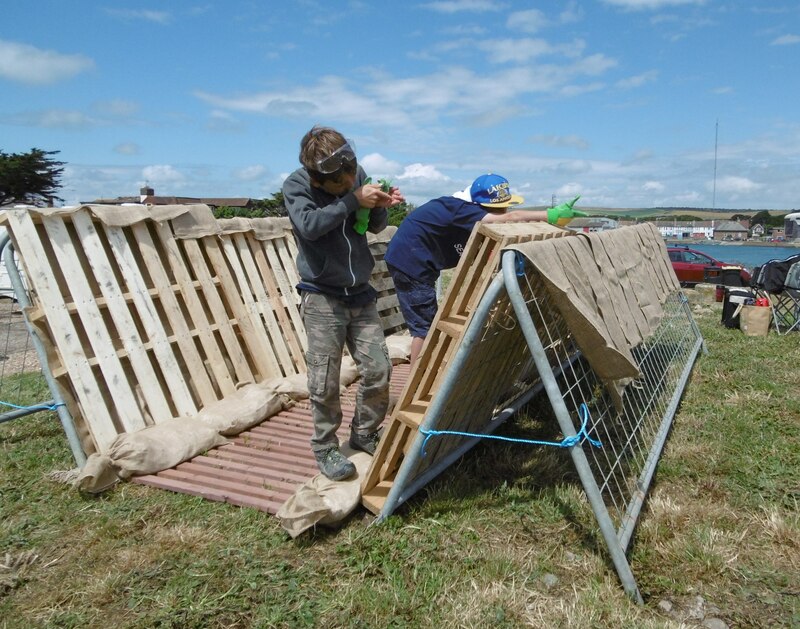 The days activities will go towards the Scouts’ Local Knowledge Activity Badge where they have gotten involved in a project to preserve an aspect of Local Heritage – in this case knowledge of Shoreham’s First World War Army Camp. The Scouts really enjoyed the day and worked very hard. The consensus was it would have been so much harder if they had had to dig the trench before they built up the walls and it would have been very scary trying to do it in the war. 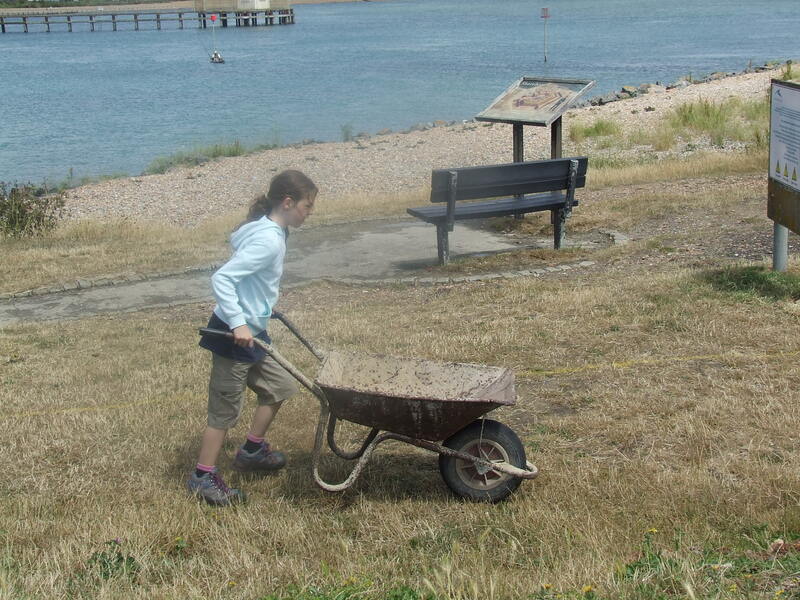 Many thanks to the the 3rd Shoreham Sea Scouts, their leaders Colin and Sandra Strong and the Friends of Shoreham Fort for their efforts on the day. Also thanks to SIG Roofing, Worthing who helped supply some of the equipment. Previous PostOn This Day 1917: Canada Day celebrated in Shoreham!Next PostOn This Day 1918: Local man guilty of stealing over 167,000 cigarettes!